Dave Sevigny won the Single Stack division at the US Steel Nationals March 28-31, 2018. The competition was held at South River Gun Club in Georgia. This year marked the 12th Steel Challenge National match and Sevigny’s 9th National Championship in an Iron Sight division. “This match has always been good and the owners found a way to make it better. Thanks to Atlanta Arms and the companies who value competitive shooting for what it brings to the gun community. Most importantly, the benefits of firearm safety and education for responsible families is one of the greatest parts of it”, said Dave Sevigny. In Steel Challenge, Dave’s primary gun is a Harrison Design and Custom 9mm 1911 with Sevigny Competition sights. His next steel competition is the North Florida Steel Challenge in St.Augustine, FL, April 21-22. Dave Sevigny is a multi-time World and National Championship competitor and trainer in handgun shooting sports. 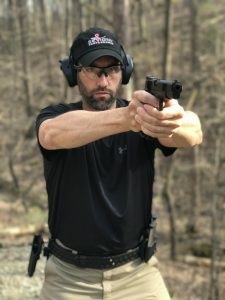 He’s won nearly 250 major championships in several different types of competitions with production pistols and guns designed to race. Sevigny competition sights are fixed and drift adjustable for many popular handgun brands. A fully adjustable Bomar rear sight for custom slides is included in the Sevigny sight lineup. Visit www.sevignyperformance.com for available sights.